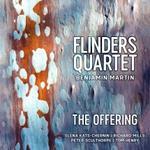 The Offering / Flinders Quartet, with Benjamin Martin, piano. Contents note: I. The circumspect ibis -- II. The rise of the airheads in public life -- III. Rêve circulaire du wombat -- IV. Rare umbrella dance of Molly Hourigan -- V. Scheming & latté drinking -- VI. The octopus quadrille -- VII. Dulcie Holland says no -- VIII. Anto tango from berlin as premonition of invasion by Russian herbalists -- IX. A prayer for Nonna Thora. 1 Oct 2017: at Flinders Quartet at Monslavat: Death and the Maiden (Montsalvat). Featuring Flinders Quartet. 29 Nov 2010: at Flinders Quartet (Verbrugghen Hall). Featuring Flinders Quartet. 28 Nov 2010: at Flinders Quartet (Iwaki Auditorium). Featuring Flinders Quartet. 27 Nov 2010: at Flinders Quartet (Montsalvat Barn Gallery). Featuring Flinders Quartet.